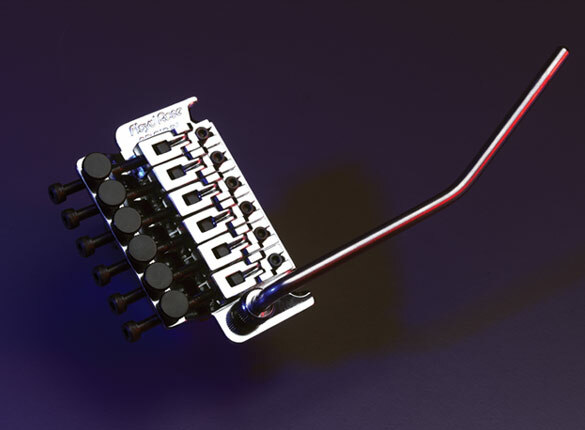 This is a guide, to try and help those Floyd Rose users, who are having trouble setting up their Floyds. You will need a 3mm Allen wrench, a 2mm Allen wrench, wire cutters, a Phillips head screwdriver, I use a Roadie Wrench all in one tool very handy for Floyd users. Also I used a tape covered battery, and pencil, doesn’t really matter, but wrap it in tape, this makes sure the finish of the guitar does not get damaged. 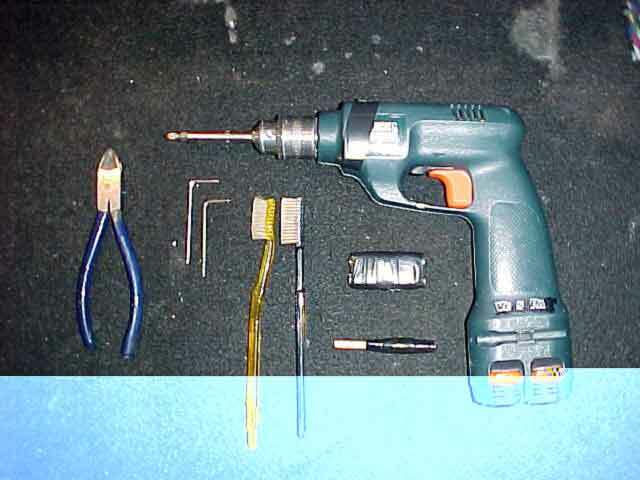 What you can do to start is unlocking the locking nuts, then lower the bar, and place the battery in the cavity. Now remove the bar as it will get in your way. Now all you need to do is unlock the string block screws, with the allen wrench 3mm. 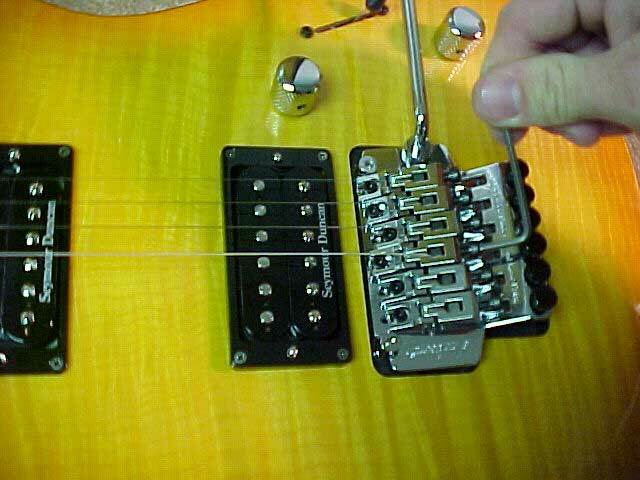 What you can do is clean the trem and frets with the tooth brush just to get the dirt off of them. You should condition your fretboard every few months to stop it from drying out, if it’s unfinished (eg. rosewood, ebony fretboards). It’s also good to clean the trem with the toothbrush as well, just make sure it’s clean or you have another one. 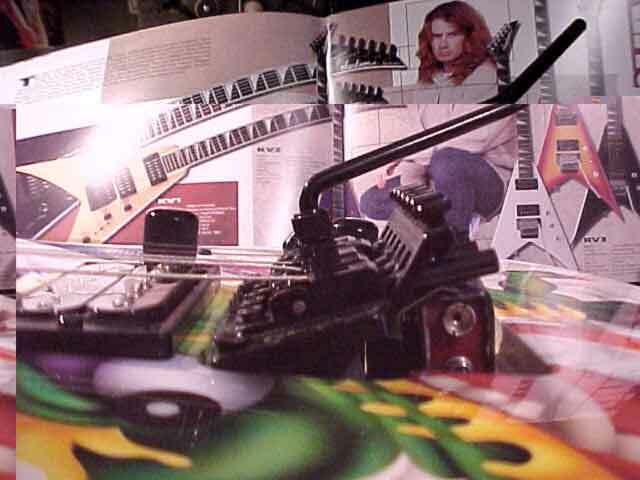 And you should oil the trem screws, and fine tuners, not too much, normal household oil should be fine. Then restring the Floyd replace the bar pull down on it take out the battery, and replace this with the pencil or dowel. What you need to do now is retune the strings, there are two ways of doing this , the first option is to tune two steps lower while the bar is slightly raised, lock the nut, then take out the dowel/pencil. After the re-moved the trem should be slightly under pitch now tune up. Or you can take the dowel up tune just under pitch, always tune up with a locking nut guitar. These Images are from Easton Guitars, untill I can get my own, so big thanks to Kevin Easton whose this guide was based off. What kind of oil can you use to clean the parts?????????????????????????????????????????????????? 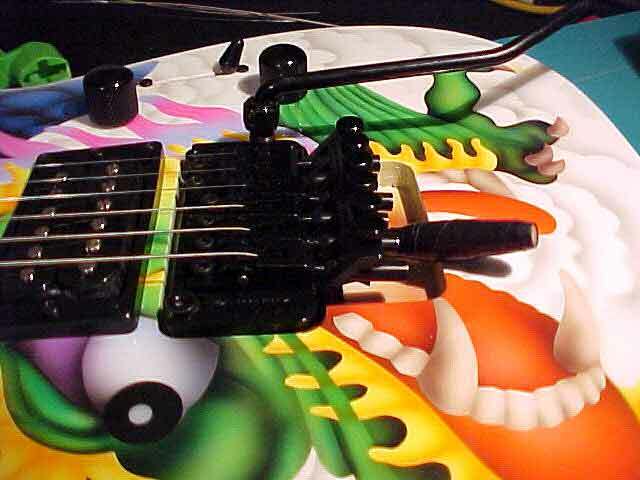 u can use pro-lube to clean and lubricate your floyd rose. but dont over do it a little goes a long way. if you do over use it and it gets on your guitar it has the potental to eat at your finsh. No you shouldn’t. MAYBE once every few years. Most necks won’t ever need any oil at all, or might benefit from one or two “treatments” over the life of the instrument. More than that is only going to have cosmetic significance (make it look shinier or darker). And if you oil it that frequently, just wait until it needs a refret — that work becomes a horrible mess. 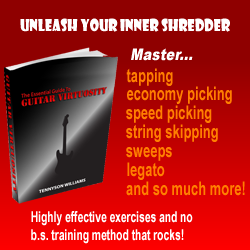 I highly disagree… for those of us who jam and play shows constantly, I find that at least once every six months you need to clean and re-oil the fretboard. Yes, it is more of a cosmetic effect, but a clean fretboard is nice to play. Using the technique I’ll describe below I’ve never ran into any problems and never make a mess. 3) Grab a bottle of lemon oil, available at most hardware stores for really cheap (a bottle should last you about 20 string changes). When applying lemon oil, IT IS VERY CRITICAL TO APPLY IT TO THE CLOTH (microfiber) AND NOT THE FRETBOARD. If you apply to oil directly to the fretboard, it will stain and put a waxy like coating on it. After the oil is applied to the cloth (you dont need much), wipe the oil onto the fretboard, then with the dry side of the cloth, wipe the oil on the fret board. Its like waxing a car (wax on wax off lol). You should only need to apply one coating unless your fretboard is really, really dry. Then your fretboard is oiled and looking shiny and healthy and clean. As well, every year and a half on my main guitars, i polish the frets with 0000 steel wool, removes corrosion and dirt without wrecking the crown. For trem oil, I used 3 in 1 machine oil that is used for sewing machines, cheap and readily available at most hardware stores. I also like to lubricate underneath the saddles with brake caliper pin lubricant (available in little pakages at your local auto parts store desk for really cheap). It’s been years since I’ve owned a guitar with a floyd rose and I think my next guitar will most likely have one. I will be using locking tuning pegs instead of the locknut. I’m constantly switching from standard to a drop D type typing. Can you set up the floyd rose in a way where this won’t cause issues?